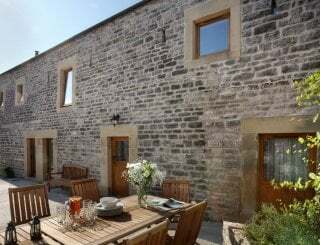 The Old Gallery at Westwood Lodge, Ilkley Moor, sleeps 5-10 in 5 bedrooms. 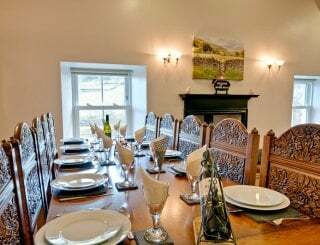 The Old Gallery, with five bedrooms and sleeping ten people, is ideal for an extended family group or a gathering of friends. Situated in what was the Victorian picture gallery, there is parking immediately adjacent and the garden (with courtyard bench seating and table) is surrounded by picket fence to keep youngsters safe. The Old Gallery has an M2 accessibility rating with two downstairs bedrooms and bathroom. This makes it suitable for guests who have limited mobility or need wheelchair access. 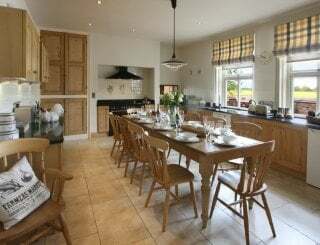 There is a fully fitted kitchen with granite worktops, ceramic hob, full sized fan oven, fridge, freezer, microwave and dishwasher. 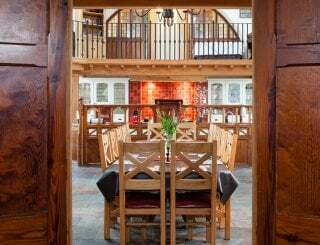 The dining area is situated by large windows where you can enjoy the vista through our gates straight out onto Ilkley Moor. The lounge area has comfortable sofas with a selection of books and games for your entertainment. The Old Gallery has a Bluetooth stereo speaker, Virgin Media multi-channel cable television, radio and catch-up services, free SuperHub Wi-Fi, i-Pod docking and DVD player. There are two ground floor bedrooms - one with a king-sized bed and the other a single. There is a ground floor family bathroom. 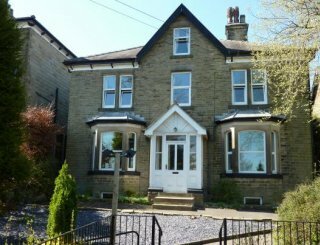 Upstairs are three further bedrooms including a large family en suite room (super-king and single or can be made up as three single beds). There is also space for a cot and this bedroom has remote control Freeview TV. At the opposite end are two bedrooms – a double and twin. These rooms share an adjacent shower room making them ideal for a family of four. All bedrooms have a clock radio and hairdryer and there is a direct dial telephone and answering machine. 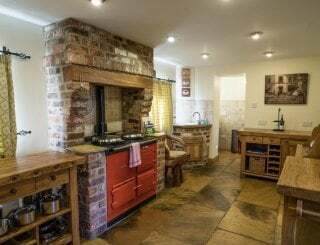 The kitchen has full sized fan oven, halogen hob, microwave, dishwasher, full-sized fridge-freezer and plenty of cupboard space! The open plan dining area has a long table and leather chairs for 10. The open plan lounge has the original grand marble fireplace and comfy sofas/armchairs. Direct dial telephone to The Old Gallery, with free local calls. Free Wi-Fi. Good mobile network coverage. Two ground floor bedrooms (double and single). Three upstairs rooms. One family room en suite (king-size and single), twin and double bedrooms. Top quality percale linen, down duvets (allergy bedding and blankets on request), fluffy towels. Ground floor family bathroom with M2 disability access. En suite to family bedroom. Shared bathroom for double/twin bedrooms. M2 wheelchair access for those with limited mobility requiring use of a wheelchair some of the time. Various aids - tap grabs, toilet seat raiser. Cot, high chair, stair gate, box of toys. Fenced garden to The Old Gallery. Wendy House, animal corner, trampoline. Barbecues, cycle shed, terrace walk and seating plus children's area. Direct access to Ilkley Moor. We have a large hot tub open daily. Ilkley has an indoor pool and one of the last surviving 1930's outdoor lidos (open in summer). Parking spaces adjacent to The Old Gallery. Additional unreserved parking, plus on-street for large vehicles. Absolutely no smoking please (inside or out). Up to two well-behaved dogs for a small charge. 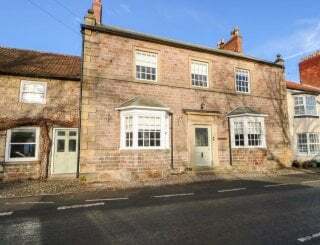 Just 2 minutes from Ilkley town centre (A65). 10 minutes from Skipton. 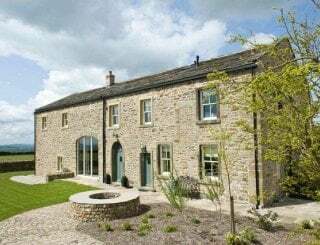 30-35 minutes from Leeds and Harrogate, M1/A1/M65/M621(M62). The upmarket spa town of Ilkley is 2 minutes drive or 10 minutes walk down the hill through the woods. A shuttle bus will bring you back up! Ilkley town centre has supermarkets, small M&S and a wide range of individual local shops. Fantastic choice of tea rooms, cafes, pubs and restaurants in Ilkley - right up to Michelin starred. Weekend breaks (arriving Friday) from £999 (3 night weekends work out at around £37 per person, per night, based on 10 staying). Midweek (arriving Monday) available. Full week from £1599. Low season offers, late deals, all current availability and virtual tours are on our website. Ilkley Station (4 trains every hour each way) is 2 minutes drive or 10 minutes walk down the hill. 961 shuttle bus runs throughout the day to our gate. Excellent local bus and rail network. Leeds Bradford International Airport is 15 minutes drive. Mon 22nd or 29th April, From £799. Sleeps up to 10. 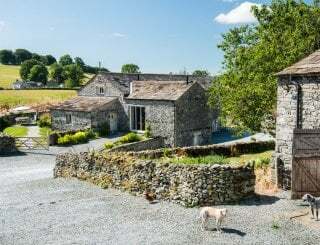 3 or 4 nights available. Hot tub, sauna etc. plus homemade cake and tea on arrival. Central, easy to reach location! Also midweek availability. Mon 13th May, From £799. Sleeps up to 10. 2,3 or 4 nights available. Hot tub, sauna etc. plus homemade cake and tea on arrival. Central, easy to reach location! Also midweek availability. Mon 1st or 8th July from £799. Sleeps up to 10. 2,3 or 4 nights available. Hot tub, sauna etc. plus homemade cake and tea on arrival. Central, easy to reach location! Also midweek availability.